Loved this!! I've enjoyed most of the Marietta stories and it was fun to read the history of one of my favorite fictional towns. McKenna and Sinclair were friends throughout their youth. Their feelings went far deeper than friendship but in 1889 society's rules said that the two could not be together. He was a poor miner and she was an heiress. After going off to college, McKenna's strong will and resentment towards the rules society placed on her leave her with broken dreams and a damaged reputation. She has no choice but to return to Marietta. Sinclair has spent this time working hard and raising his status in life. No longer is he a poor miner, he is a mine owner and someone who demands respect. Sinclair is not happy about how the town is treating McKenna when she returns and vows to do everything in his power to help her. Keeping her out of his heart again will be the hardest thing he's ever tried to do. This one is very well done and definitely a book I recommend. 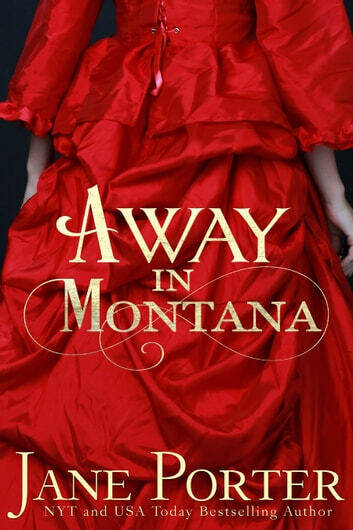 Away in Montana by Jane Porter is book number one in the Paradise Valley Ranch series. This is McKenna Frasier and Sinclair Douglas' story. This story takes place in 1889. Things were definitely different during that time especially for women. If a woman made a mistake, it could cost her everything. McKenna and Sinclair 'Sin' have a history and their relationship did not end well. McKenna has been forced to return to Montana due to her reputation being destroyed. She has also been disowned by her wealthy father. McKenna is lucky to get a job teaching school. Sinclair doesn't want to help McKenna or love her. But, will Sinclair move on with his life or take a chance on McKenna again? Will McKenna and Sinclair get a second chance at love? This story was an emotional and sweet romance during a difficult time for woman. Be prepared for surprises and twists in this story. I voluntarily reviewed an Advance Reader Copy of this book. Historical Romance in Marietta, Loved it!! I love visiting Marietta, Montana but this story is set in historical period of the late 1880's. You will see some familiar family names and places in Marietta that we all have become to love!! McKenna and Sinclair have a history from years previous but McKenna did not want to settle down, the little rich girl wanted to experience life but all it got her, was the title of being scandalous. She has know been disowned by her family and is now the new school teacher in Marietta. Sinclair has always loved McKenna, the poor boy in town. Now the wheels have turned and Sinclair has made it beyond rich. His heart still belongs to strong, independent McKenna but can he change her mind. I loved this book!!!! The banter between McKenna and Sinclair is wonderful. McKenna is such a strong independent girl, nothing will stand in her way. Sinclair, just needs to find away into McKenna's heart, he won't give up! I can't wait to read more historical romances set in Marietta. I highly recommend this wonderful story!! I got this book as a freebie and glad I downloaded it. Jane Porter is a wonderful author. This book was both heartbreaking and a true love story. Shows the beginning of women's independent thinking and man that is not intimidated by her.